John Wells is the only CIA agent to ever penetrate al Qaeda. While living in the mountains of Pakistan, he became a Muslim, convinced of the decadence and shallowness of the United States. When I started reading this book I actually thought that it would be a very good solid read, but I quickly found the story boring and at times pointless. I really did not understand why some chapters were even in the book because it just didn't add to the work. In a way it just pulled you away from the story like some kind of commerical that has nothing to do with the story. I do not wish to "rob" people of the story but I just didn't think that book had any adult level development. I still don't understand why the CIA and the FBI just had no problem allowing this guy to just leave them when he was still an agent of the United States that really got on the inside of this very sterotyped terrorist group. Whatever happened to being debriefed? Yes, he was asked some questions and given a hard time by one examiner - it still just touched the surface and ended right there. Remember that this guy was the only guy that was truthly on the inside. Another problem that I had with the author was the blue eyes ideal of beauty and rightousness. He used this crap about three times in the book. I remember thinking that this author's ideal of beauty reminds me of Nazi Germany. Sadly, the terrorist were just too mainstream to be taken seriously. The end of the book was even worse. It was as if the author had to finish the book quickly or just got tired of the story himself. What was the chance of the "hero" actually finding and stopping the bad guy the way he did...was just something from the childrens book section. I really feel that this book was hyped up because of the author and maybe his career position. This book rates high only on my list of reads "with silly and weak endings." One of the better thrillers I've read in a while. There's much to like about "The Faithful Spy". The story feels both credible and well researched. The central character is interesting and the plot maintains the suspense with plenty of unexpected twists. I've read a number of thrillers and this is one of the better ones. It falls short of being a five star read for me. The beginning and end of the book are gripping, but it slows right down in the middle (when the lead character is largely absent from the action). The story covers a lot of ground, from the front in Afghanistan to interrogations in Diego Garcia, from behind the scenes at the CIA to secret terrorist cells in the US and Canada. This is a tricky balancing act and at times the pace got bogged down with explanations about US policy or by Berenson's need to personalize events by fleshing out even minor characters. Since we have had such a massive failure of both intelligence and imagination while trying to figure out what the Islamic world is thinking and doing, it would be very tempting, I would think, to write a thriller that fixes everything. 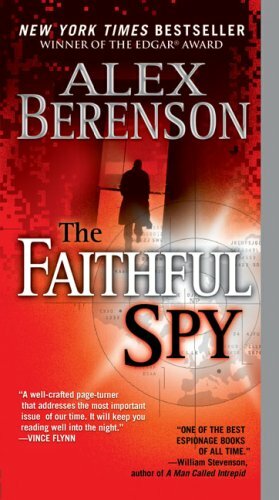 Perhaps the most admirable thing about Berenson's The Faithful Spy is that he doesn't give in to temptation. John Wells' years undercover with al Qaeda-linked groups are not detailed here, but the end result is. He's no superhero, and thus much more interesting. Isolated emotionally, culturally disoriented, easily knocked off balance when he discovers his Kodak moment back in the States isn't reality, Wells is a man with many strengths and few weaknesses, but we get to see all of him, not just the winning parts. The political self-aggrandizing back in Washington rings true -- men more concerned with being right than getting the job done. But even here Berenson doesn't fall into a simplistic dichotomy of good guys/bad guys. Wells' faith in Islam is presented very positively, but not in a preachy way. I was reminded here of that great Showtime series, Sleeper Cell. The plot is well-constructed and very fast-paced. As everyone else says, it will keep you turning the pages. The writing is good, although it drove me nuts that he doesn't set off introductory phrases with commas. But maybe that's an editorial decision. Berenson has a real gift for characters. He develops the men very quickly and very well, although he's less adept with Jennifer. But even there, he shows considerable insight. He is guilty of that made-for-TV-movie trick of introducing you to a character sympathetically so that you will feel all the worse when the person gets blown away five minutes/three pages later. But that's a better problem to have than not bothering to draw people at all. The French student, the bouncer, the Bronx bomber, all are vividly but economically drawn. You'll remember them long after you've closed the book with a sigh. The specificity and grittiness of the settings - not just in Afghanistan and Pakistan, but also in Atlanta - make the action believable, just as the exceedingly timely nature of the threats make the reader loose sleep. Berenson makes the threat feel real and personal, not some amorphous force with an Arabic accent. He's very good on contemporary politics, too, illuminating moral dilemmas - torture of prisoners, the technology of invasion - while avoiding either the vapid or the blood-thirsty. ... which is really just the old world full of danger, doom, gloom, and all the rest. I don't care much for the "man" John Wells, but he's a lovely character. He's a bit of an antihero. Of course, no other characters are as well developed as he is, but there's a fair bit of page work going into fashioning his strong, silent type character. Is the book stereotypical... yes, but I'll have you know it's not very flattering to mainstream American either. It mainly focuses on this wonderful country as full of rich, promiscuous, gluttonous idiots. (ok, so maybe I added gluttonous) You get the point though, right? Berenson doesn't seem out to overly flatter anyone. This is the most compelling novel I have read this year. The author's efforts fully justify the front cover endorsement by writer Vince Flynn. The Faithful Spy is gripping, suspenseful and ingeniously plotted. The characters are all well developed. The perspective provided by John Wells (the faithful spy) is both enlightening and uniquely refreshing. September 11, 2001 woke America up to facing perils we had previously consigned to other parts of the world and to fiction. Now, a novel like "The Faithful Spy" isn't merely a diversion, a beach thriller to quicken adrenaline for fun. Now, the situations that author Alex Berenson sets in motion and "detonates" one way or another don't float above us in dispassionate entertainment mode only. No, reading about the passengers on a transatlantic flight who suddenly sight military fighters pacing their airliner makes our stomachs clench with sympathetic anxiety and a "but for the grace of God, it might be my flight" thought. As least that was my reaction. And shadowing the title character to his cliffhanger meetings with al Queda members, high-level and low, filled me with cold dread because I don't imagine the real men who follow Bin Laden being much different. John Wells, "The Faithful Spy," and his one-time handler, Jennifer Exley, are people who must balance on a very narrow moral ledge (about matters such as when to "justify" torture and killing) in the name of national security and survival. Their dilemmas are ones that are not and should not be solely fictional. Berenson's reporting experience in Iraq and his understanding of the strategic struggle between the U.S. government and Islamic extremists lends this novel authenticity and valuable insight into our actual geopolitical situation. "The Faithful Spy" isn't a perfect pulse-pounding novel; it contains certain intervals where the action lags or the plot doesn't coalesce as convincingly as a seasoned reader of this genre might prefer. However, the relatively minor flaws of pacing and storytelling don't diminish the clawing feeling that this book of "fiction" could portend tomorrow's real headlines. God (by any Name) forbid. I picked up the Faithful Spy because it was getting such dynamite reviews. Some of what is here in this book merrits such praise. However, the plot and characters bring down the house with their overboard ambitions. Its sort of odd that this book which tries so hard to be one of the quiet thrillers that doesn't over-whelm the reader as if it were Die Hard Seven, is in the end overblown. Yet components of this novel just are so far fetched that you start groaning after a while. One of my least favorite tricks that authors use is in full glory here. That is skipping from one character to another. Its not done terribly here, however it ends up taking the reader out of the flow very often and you end up not being as drawn in as you could have if this story were created in a linear timeline fashion. See Harlan Coben for an author who pull this off well. While every last detail of this fine book may not end up to be certain (let's hope not), the general direction of the story is probably accurate. It is a chilling story to contemplate. I picked up this book at a gas station while on a long road trip. I was hesitant at first because I don't usually read this type of novel. But, pickings were slim, so it was either this or a true crime story. I have to tell you, I was disappointed when the trip was over and I had to stop reading to unpack the car! I couldn't wait to get everything put away so I could get back to reading. The author keeps the story flowing with ease. You just have to know what's going to happen next! I thoroughly enjoyed it and have added Mr. Berenson to my favorite author list. What if the CIA had someone inside Al Qaeda all along, well before 9/11. A spy who might be able to actually get an audience with OBL and other terrorist plotters. That is the premise of this engrossing novel. John Wells infiltrated Al Qaeda well before 9/11, well before Bush became President. But now the CIA is unsure about what to do with this valuable asset. Since he didn't give them advance knowledge of 9/11 his CIA handlers are not able to easily place their trust in him, even as Al Qaeda continues to plan new acts of terror. But Wells remains committed to learning more about these new terrorists plans. Can Wells, now a devoted muslim, be equally dedicated to the USA and to his religous beliefs? These are some of the plot elements in this exciting and well written book. The author also takes the time to fully develop the muslim characters and give voice to their mindset and the grievances they have against the United States. When Wells is finally called upon to become more centrally involved in a new plot he finds himself all on his own, trusted by no one. And everything is at stake as Al Qeada wants to one up themselves with a plan even more deadly than 9/11. Alex Berenson, a reporter for the New York Times knows how to weave a thriller and pulls off this story from the first page until the heart-stopping conclusion. is John Wells.He is a CIA agent who has sucessfully infiltrated al-Qaeda. of Wells mount on both sides. Wells discovers another attack on American soil is about to occur again. attacks.This makes for an exciting conclusion of the story.Read this book. Alex Berenson is a relatively new author and The Faithful Spy is his first book. The CIA are able to plant an agent, John Wells, deep into al Qaeda. The departmental interplay is typical and frustrating to the characters and to the reader, but it feels and seems very real. Berenson has developed a couple of very good characters that will have me coming back for more. With the plot simple and the writing adequate but not notable, I gave this book a 3 star rating. The storyline was enjoyable and the reading was quick. Berenson has two more books as sequels and I plan to read them. As with many first books, the author does not quite hit the home run. But this series is definitely something to build on. Let's cut to the chase...get on the Berenson Train now!